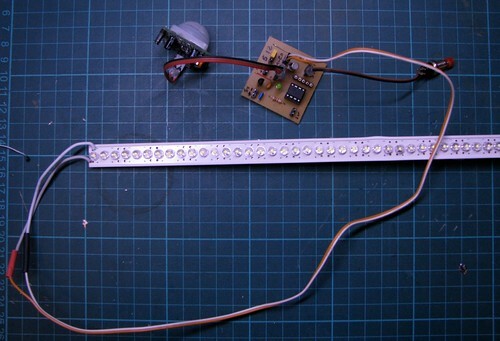 This project illustrates how to use an ATTiny microcontroller and an RGB LED to create a coloured light that cyles continuously through random colours, but changes colour dramatically at the press of a switch. Why? My kids had this $2 novelty pen that did this employing a teensy circuit along with 3x3mm LEDs and some alkaline coin-cells. They broke it almost instantly, losing some critical small parts. "Daddy, my light-up pen broke! WAAAAAAAAAAAAAAHHH!!!" Having deprived themselves of the captivating coloured lights, they then drew on the walls with the instrument-formerly-known-as-the-light-up-pen. Then they experimented with strangling each other with the pen's narrow ribbon lanyard. I decided to replicate the pretty light without the other problems. This circuit produces coloured light by using an 8-pin ATTiny13 microcontroller and Pulse-width-modulation (PWM) to vary the brightness of three LEDs (Red, Green and Blue) that are closely located, or share a common package. I used a common-anode 5mm RGB led, which looks just like a normal 5mm LED but has 4 leads instead of two. Since the ATtiny13 only has one timer with 2 PWM channels, it cannot control 3 PWM channels in hardware. Instead, I do the PWM logic in software, timing the pulse modulation via a regular tick (interrupt) from the ATTiny's hardware timer. (Nowadays you can get the ATTiny45 and friends which have 3 PWM channels, but I could not obtain them when I first built the prototype for my middle child a couple of years ago). My youngest child is now 2, so I dug this project out of the mothball bunker for her to play with. WARNING: modern multi-colour LEDs can be PAINFULLY bright. If children will play with this, choose one of the following: ensure your LED is not a superbright, or use a diffuse led, or diffuse a clear one (eg cover it with half a table tennis ball, or enclose it in resin or wax. You could also use higher-value resistors to limit current, or lower PWM_OC_MAX to limit the PWM duty-cycle (LED brightness) via software. Source code and schematic are available as usual from github.com. The microcontroller should be configured to obtain the system clock from the 8MHz internal RC oscillator. The ATTiny13 factory fuse settings include a divide-by-8 of the RC oscillator giving 1MHz, so remember to change that fuse to get the original 8MHz signal.. The overflow interrupt from the hardware 8-bit timer triggers an interrupt service routine (roughly 32000 times per second) which increments each of 3 separate 8 bit counters. These counters, and corresponding "Output Compare" (OC) values are used to generate 3 Pulse-Width-Modulated waveforms, with each counter being associated with a particular output pin. Every time a counter reaches zero, the corresponding pin is turned on. When the counter reaches its PWM_OC value it is turned off. When the counter reaches its PWM_TOP value (255) it wraps around to zero and the cycle repeats. The effect of all this is that each of the 3 output pins is driven with a square-wave having a wave-legnth of 256 timer ticks (about 1/128 of a second), which is equivalent to a frequency of 128Hz (cycles-per-second). The OC value controls the "duty-cycle" (ratio of on-period to off-period) of the wave, with 0 giving always off, 255 always on, and any intermediate value giving a wave that is on for x/255 of a cycle and off for the remainder of each cycle. If an electric light is powered by such a square wave, with a frequency of more than about 50Hz, the human eye does not percieve any flickering---instead changes in the duty cycle are perceived as changes in brightness (this is how most household dimmers work). With 3 leds in Red, Green and Blue, and the ability to vary the perceived brighness of each, you can produce many different colours, exactly as is done in modern TVs and projectors. So using 3 PWM outputs, we have a coloured light that we can set to any brightness and colour (denoted by a particular [R=x, G=y, B=z] tuple) that we desire. BTW, it's not strictly necessary to use 3 separate counters. 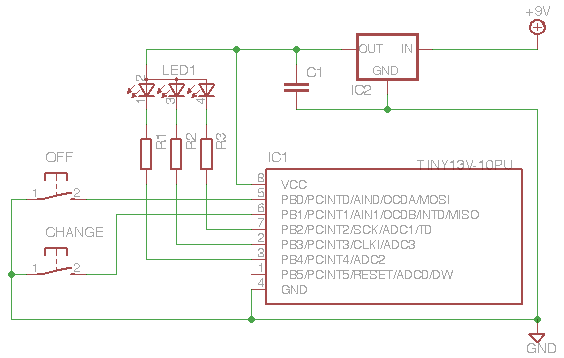 A single counter could be used with 3 different OC values to control each output pin independently. I chose to implement 3 distinct channels (rather than 1 channel with 3 Output-compare values) out of some voodoo idea that running the channels out-of-phase will lower the peak current draw and give slightly longer battery life. For example, if you set PWM_TOP to 240 and PWM_OC_MAX to 80, then if the PWM counters are initialized at 0,80 and 160, the 3 output pins will never be on simultaneously, and peak output current will never be more than 20mA. This also means you can get away with ONE resistor instead of 3. A coloured light isn't very interesting. But I have it on good (2 year old) authority that a pulsing and constantly changing light is captivating. For each of the 3 channels, at the end of every PWM cycle (when the counter reaches 255), the duty cycle of the particular channel changes by a small amount. This causes the colour to change. The rate that each of the PWM channels changes duty-cycle is chosen semi-randomly such that an ever changing progression of colour is produced. A pulsing coloured light is nice, but when you're 2, a BUTTON TO PUSH is best of all. If the CHANGE button is pressed, the LEDs are reset to all off (OCx=0), and the cycle-rate of one channel is changed to a new random value, giving an abrupt change of colour, followed by a new and different progression of colour changes. Small children love this and will sit and frob the button for ages, before they break it or lose it. Then you can make them something else. A second button acts as an "on/off switch" (actually triggering a low-power sleep mode, and waking from same). Both buttons trigger interrupts via the pin-change interrupt facility. The buttons are "debounced" in software, by masking further interrupts for a certain interval after any button interrupt. I prototyped this on a solderless breadboard, and programmed the ATTiny with an AVRUSB500v2 programmer, which has the useful advantage of using a 1x5 connector instead of the more common 2x3 or 2x5, allowing simple in-circuit programming of breadboarded AVRs. Once I had the software working, I built a soldered prototype on a scrap of pad-per-hole proto-board. With only 5 data pins, and 2 power, you can just plonk the components down next to the chip socket, and either use point-to-point wiring and/or chains of bridged pads. If you're bridging pads, use the cheap phenolic protoboard, the high-end green fiberglass boards with solder masking are commendably resistant to solder bridging. You can use any simple voltage regulator (or none). The ATTiny chips come in a 5v version that runs to 20MHz, or a low voltage version that will work off as low as 1.8v (but is limited to 4 or 10MHz) . I used an LP2950 low-dropout regulator, which will easily give you 5v from 4 alkaline cells, or 3.3v from 3 cells. If you're using a 9v battery, the cheap and common 78L05 (which needs an input of at least 7 volts) works fine too. You could even leave the regulator off entirely, if you use a 4.5v alkaline pack or a 3.7v lithium. The low-votage ATTiny13v is remarkably forgiving (but remember to set the brown-out fuses to an appropriate low-voltage cutoff). 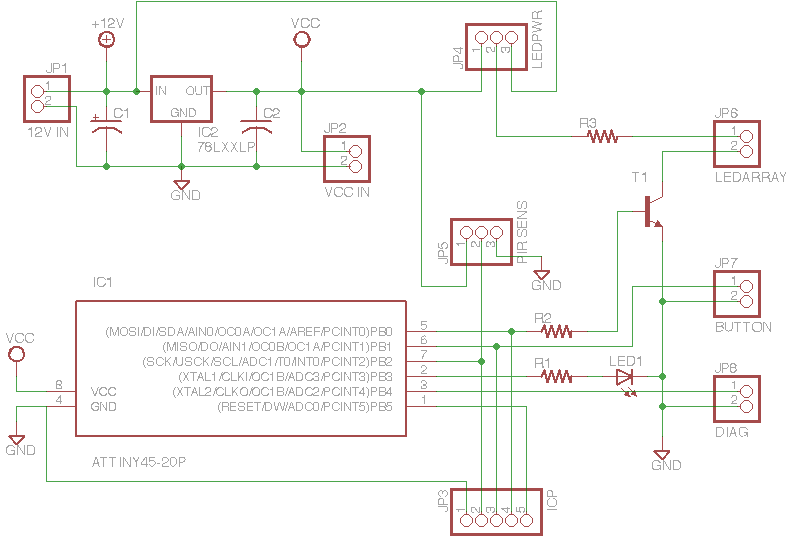 I haven't bothered to design a PCB yet, as it wouldn't be significantly more compact than the protoboard version. I suppose an SMD version would be interesting---it could be made not much larger than the coin cells that power it, giving some interesting swallowing-hazard fun to be had. Every time I see household lighting left on overnight for "security", I think of the coal-smoke belching into the atmosphere to power it. This kind of silliness has got to stop, besides the environmental cost it will soon become prohibitively expensive if carbon-taxing ever gets off the ground. My kids, however, (aged variously 1-7) have a habit of getting up several times in the night to bump their way to the bathroom, and they always leave every light switch they encounter on the way ON (not actually being awake enough to deal with turning them off). 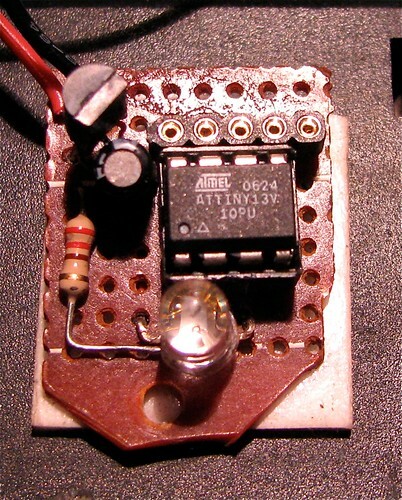 Atmel ATTiny45 Microcontroller. Also works on Arduino & variants. I orginally chose a 10mm 0.5W LED (from Oatley Electronics), because it is bright enough to light a bathroom or hallway at night, yet does not require any heatsink. A resistor is used to limit the maximum current to around 150mA at 5v. Since I first created this project LED arrays have become stupidly cheap, typically sold as automotive interior and underbody lighting. Examples are here and here. Arrays of 10-100 SMD leds, either in grids or strings are available pre-assembled with integrated current-limiting resistors suitable for 12v power. Typically 4 or 5 LEDs are chained with 1 resistor, and 1-20 chains are connected in parallel. The entire array consumes only tens or hundreds of milliamps at 12v, and produces a quite impressive amount of light. The version of the project presented here is capable of driving LEDs from either 5v (via regulator) or from the external voltage input (eg 12v). Source code and hardware files are available at GitHub. You can power the circuit from battery, from a regulated power source (say an old phone charger), or use a regulator such as a 7805 or MCP1700 to get 5v from an unregulated supply. If you are powering your LED from the regulator (rather from the main supply), choose a regulator that can supply enough current. An 8-pin ATTiny45 is used here, althoug it is hardly worked hard. The code can be made to run on an Arduino (or other ATmega device) easily enough. Only about 400 bytes of flash is used, and there are several pins spare. There's enough capacity left over to implement a communications interface, so your household LED lighting could be remote-controlled. I plan to work on this enhancement soon. A transistor is used to control power to the LED. A general purpose medium power TO92 switching transistor capable of handling around 500ma (eg 2N2222, or 2n3907) is suitable. The pads for the transistor are arranged to allow use of a TO92 or TO220 package. A jumper selects whether the LED and transistor are powered from regulated 5v or external (12v) power. A current limiting resitor may be fitted to the board, or replaced by a link when using a LED array with integral resistors. The microntroller drives the transistor with a Pulse-Width Modulated (PWM) signal, allowing the LED (or LED array) brightness may be varied over 256 steps from 0 to 255. This allows the main LED to be left in a low-brightness state as a night light, and also allows the light to be faded in and out gradually, which is kinder on sleep-deprived eyes. Aa 3 pin header provides power and ground to the PIR module, and reads the sensor's the TTL output signal. The PIR signal is connected to an input pin and monitored via a pin change interrupt. The PIR module itself inhibits re-triggering for an interval after each trigger which can be adjusted via a trimmer pot. If the LED array is off, and the PIR triggers, the LED array is faded on quickly. A 5 minute timer is started after which the LED array is faded off again. If a PIR trigger occurs while the array is lit, the 5 minute timer is reset. The effect of this is for the light to remain on while you are moving about, and to slowly fade off off five minutes after you leave the room. The on/off switch can override the timer for fast-off or remain-on. Internal pullup is used to hold the button input pin high unless the push-button connects the pin directly to ground. De-bouncing is performed in software. If the LED is off, the push button causes it to fade on quickly (over about 1 second). A release or second push while fading on freezes the light at that brightness. If the LED is on, the push button causes it to begin fading off (over about 4 sec). A second push during fade-off freezes the light at that brighness (a dimmer). A third push resumes the fade-to-black (off). There are at least 2 pins spare (more if you disable the RESET pin, or use fewer inputs). One of them has a normal LED connected to act as a power-on status light, handy for finding the on-switch in the dark if you do not employ a PIR sensor. Headers are included for other spare pins for future use. a potentiometer connected to an analog input pin for setting minimum brightness level for 'night light' mode. The circuit was prototyped and tested on a solderless breadboard, where the microcontroller was programmed in-circuit. A version was then constructed on proto-board, of the type whose tracks are laid out like a solderless breadboard. This is a very handy way of migrating a breadboarded circuit to a soldered equivalent. Once the design was proven to be workable, a PCB version was etched. A few shortcomings were made evident by the first PCB version - some of the tracks could have been made wider to give resistance to lifting due to component torquing. It would have been handy to run 5v to all the input jumpers, so that active sensors could be connected to any of the spare pins. More pictures of construction and deployment in my pir-lite photoset.